I spent some time today trying to track down the "misfire at high revs" problem on the race car. I fitted an electronic ignition unit but it hasn't helped. It wouldn't fit properly in my distributor due to (I think) wear in the shaft so I used a brand new Lucas distributor body I'd had in the garage for a while. I'd like to try changing the coil again for a brand new one. I ordered one but unfortunately I've been sent the wrong part so it will have to be exchanged before I can try that. Otherwise I'm running out of ideas. I also drained the oil catch tank today and was somewhat alarmed when almost a litre of bronze coloured water (or what appeared to be water) came out along with the expected small amount of white frothy oil/water mixture. I can only assume that it was a years worth of condensation as I hadn't drained the tank for ages. There did seem to be rather a lot of it though and it was a strange colour. I'll have to keep an eye on the tank and see if it starts to build up again. 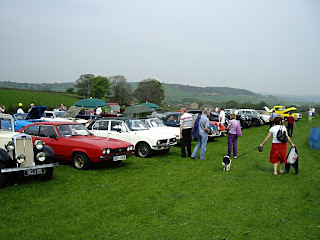 In between all this, and trying to do some overtime for work, I went to the Bronte Vintage Gathering which takes place not far from here. Spent a couple of hours viewing an assortment of classic cars, tractors, commercial vehicles and steam traction engines. Also the obligatory stalls, mostly selling tat. I bumped into Dave M there showing off his Triumph Dolomite. Only took the one picture but there was quite a lot going on around the field. Filled some time anyway.